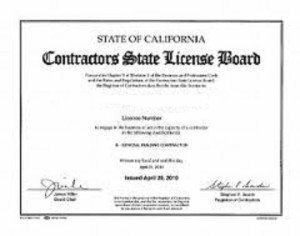 IN THIS SERIES OF POSTS, I’LL TELL YOU HOW TO GET A CALIFORNIA CONTRACTORS LICENSE. HERE IS THE FINAL PART. 26) Should I Incorporate, operate as a Sole Owner or a Partnership? a) The differences between these entities are that when a license is issued to a Corporation, it belongs to the Corporation. Qualifiers and Officers can come and go, but the license belongs to the Corporation. 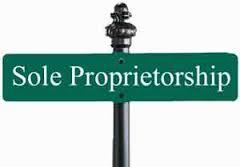 b) A Sole Owner license does not have the protection that a Corporation has, but the license belongs to the individual. c) A Partnership requires at least two parties, a Qualifying Partner and a General Partner. If either partner leaves the company the Partnership License is automatically cancelled. 27) Can I form an Limited Liability Company or LLC? Yes. As of 1/1/2013, contractors are now allowed to form LLC’s. The problem is, only 10% of LLC applicants are issued licenses. That is because the financial requirements to obtain a $100,000 surety bond are very strict. Think twice about applying for an LLC license. And consult with your CPA before doing anything. 28) Are there advertising requirements? Yes. Your license number must be on ALL advertising materials. 29) Can I advertise that I’m bonded? No. State law prohibits advertising that you are bonded or insured. 30) Can I offer Electrical services if I have a Plumbing license? No. You cannot advertise, offer, or enter into a contract to perform services for a classification that you do not hold. There you have it. 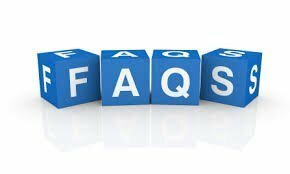 The 30 most frequently asked questions about how to get a California contractors license. Remember, Contractors License Service, and The License Guru are always here to answer any questions you may have. So don’t hesitate in contacting us. 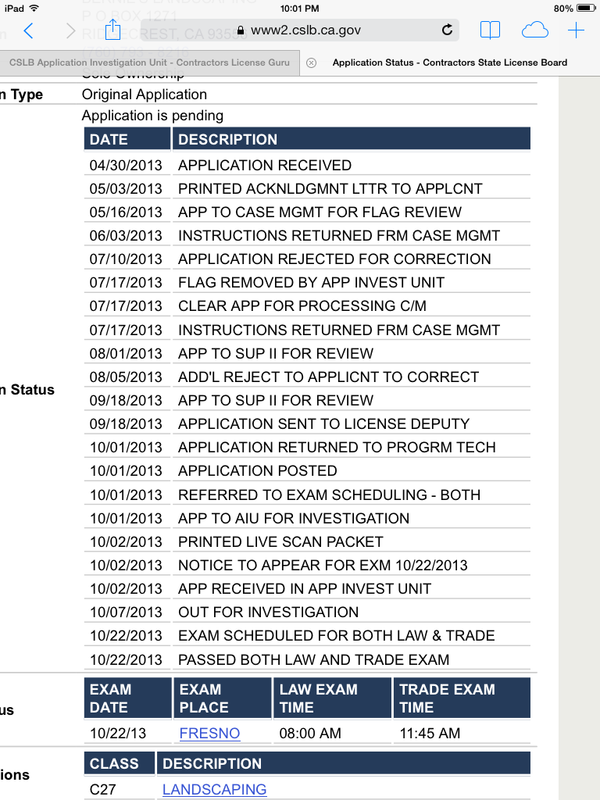 Here we are again, CSLB application processing part 2, where I received a screen shot of an application timeline. This poor guy is being bounced around like a golf ball in a blender. 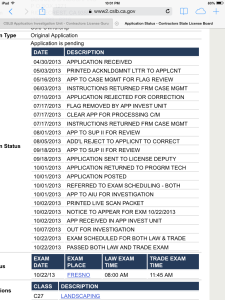 You can see in the image below that the application was submitted on 4/30/13. 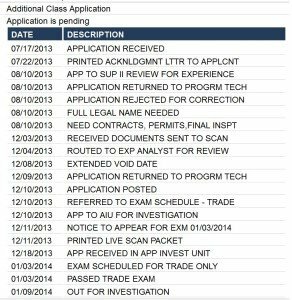 After being sent to the case management unit for a flag that was cleared on 7/17, almost three months later, the app was then sent to a licensing supervisor on 8/1. I’m assuming this was either a classification clarification or experience related. On 8/5 the supervisor returned the application to the technician with instructions to reject the app to the applicant for a correction. Then on 9/18, the application was sent back to the licensing supervisor for review again. I’m assuming to review the classification clarification or experience outline. The application was also sent to a “License Deputy” for review. Again, I’m assuming it’s for experience. On 10/1 the app is returned to the application technician with instructions to post the app and schedule him for the exams. You would think that should be the end of it. 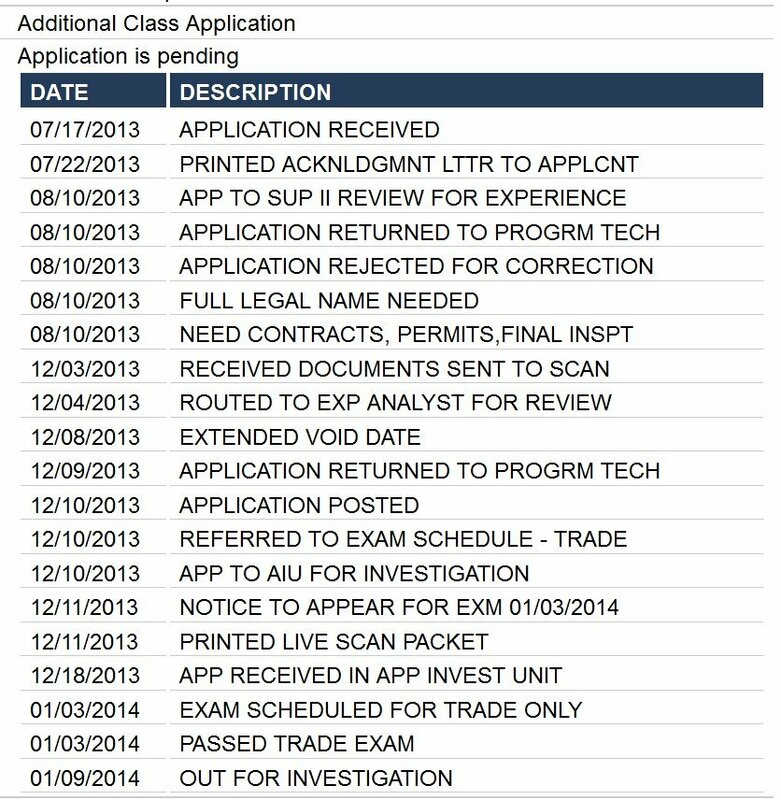 It’s been to a supervisor twice and to a “licensing deputy.” But no… the app is referred to the Application Investigation Unit or AIU on the same day they schedule the exams. This is the part that really fries my shorts. Why do they insist on scheduling applicants for the exams AND send them to the AIU to verify their experience? If they are not qualified for the exams, and they require the applicant to prove his experience with the AIU, why send them to exams in the first place? Moving on, the application is “out for investigation” on 10/7, but an “investigator” in the AIU will take at least a month before he/she contacts the applicant. On 10/22 the applicant passes both the law and business and trade exams. Here we are, it’s January 15th, and the application is still “out for investigation.” Full disclosure… the applicant hasn’t told me yet what communication he’s had with the investigator, if any. So it could be that he’s submitted documents to be reviewed and is waiting for a determination to be made. Or, he may still be waiting to hear from the investigator. Bottom line… anybody could look at the process this application has gone through and wonder if the Contractors State License Board is truly inept or just dysfunctional. Why did a “licensing deputy” review and apparently approve the application and then sent it to enforcement? Does the “licensing deputy” have the necessary training and experience to adequately review an application? The timeline below suggests, No. If you find yourself in this situation, contact your State Assembly Member’s office and file a complaint with them. You can also file a complaint directly with the CSLB. Click on this link to download the pdf. CSLBClientServicesComplaintAndSuggestionForm I know that is kind of like asking the fox to look over the hen house, but at least the Registrar’s office is aware of what’s going on under his nose. In this series of posts, I’ll tell you how to get a California Contractors License. This is part 2. 6) HOW DO I PROVE MY WORK EXPERIENCE? You ask someone in the building trades who has direct knowledge of your work to sign a “work cert” (Certification of Work Experience). You do not need a work cert for each and every job. One person may sign for all four years of required experience. The best way, according to the Contractors State License Board, is to use employed experience and to provide pay stubs proving that experience. 7) CAN I QUALIFY WITH “SELF-EMPLOYED” EXPERIENCE? 8) CAN I USE OWNER/BUILDER EXPERIENCE? Yes, but I recommend that you don’t. O/B experience is reviewed separately to evaluate the amount of experience time you will be granted. On average, the time you are granted is at least ¾ of what you submitted. 9) WHAT HAPPENS IF MY APPLICATION IS NOT APPROVED? The application will be returned with a letter asking you to supply additional information or make corrections. You will have 90 days to comply with the letter. 10) IS THERE AN EXAMINATION REQUIREMENT? Yes. The qualifying person must pass the Law & Business and Trade exams, unless he or she meets the requirements for a waiver of either one or both exams. If you’ve taken and passed an exam within the last five years, you do not need to re-test. If you are applying for reciprocity, you’ll only have to take the law and business exam. Stay tuned for How to get a California Contractors License Part 3. In this series of posts, I’ll tell you how to get a California contractors license. All businesses or individuals who construct or alter any building, highway, road, parking facility or other structure in CA must be licensed by the CSLB if the total cost including labor and materials is $500 or more. 2) What are the advantages to having a contractor’s license? A. You can do jobs that are over $500. C. You can legally advertise your construction business. D. You can pull building permits. E. You are eligible for special discounts from many material suppliers. F. You can join builders’ associations that offer job boards, plan rooms, and group insurance. 3) What are the licensing classifications? The classifications are broken down into 4 categories. 4) What experience is required? At least four years of journey level experience is required to qualify for the exam. Credit is given for experience as a journeyman, foreman, supervising employee or contractor or a combination of experience and education. 5) What if I do not have four years work experience? You may still qualify by substituting apprenticeship or technical training or other education for work experience. For example, you could receive a credit of up to two years for a college degree in business. You don’t necessarily need a college degree. Transcripts showing course work in construction technology, drafting, accounting, etc., can also be substituted for a portion of the four-year requirement. Has the CSLB Application Processing system completely run afoul? I apologize if I spend too much time discussing this topic, but it really fries my shorts when State agencies abuse their power. I received an email from an applicant who applied to add a classification to his existing license. You will see in the image below that the CSLB Licensing Unit requested additional documentation. The applicant submitted the documentation, it was accepted, the application was posted and he passed the trade exam. Six days after passing the exam, his application was sent to the infamous Application Investigation Unit, or AIU. Why?? The AIU is going to ask for the same documentation. Doesn’t this suggest that the Licensing Unit is incompetent? They chose to take on the role of experience verification experts. Are they incompetent? Do they not feel that they can perform these duties sufficiently and accurately? They did send the application to the investigation unit after they approved his experience documents, so that suggests the answer is No. Being a Navy vet, I’m used to following set rules and guidelines. The CSLB needs to create a set of (reasonable) rules and guidelines and follow them. Making up the rules as they go along is wrong for any business, but for a State agency to do it is just flat unacceptable!